In spite of the push since the release in 2010 of the Common Core learning standards to get students to read more nonfiction, lift hasn't even reached 10 percent in most states. The only outliers were New Jersey and Vermont, where the gain was greater than 10 percent. And whereas the National Assessment of Educational Progress (NAEP) reading framework targets fourth, eighth and 12th graders to read an ever-growing proportion of non-fiction, in reality, they appear to read less with every passing grade. For example, in grade 4, the NAEP target is 50 percent, while the percentage of non-fiction books read by students is only 26 percent; in grade 8, whereas the goal is 55 percent; the share is only 22 percent; and by grade 12, when the NAEP benchmark is 70 percent non-fiction, only 20 percent of what students read is made up of that kind of content. STEM books, specifically, make up just 7 percent of all books read by K-12 students; elementary students read a higher percentage of STEM books than either middle schoolers or high schoolers. Those findings come out of this year's "What Kids Are Reading" report. The report is issued annually by Renaissance, based on data generated through the Renaissance Accelerated Reader platform. Accelerated Reader provides quizzes to students after they've read books and articles, letting their teachers know how well, how much and at what challenge level they've been reading. 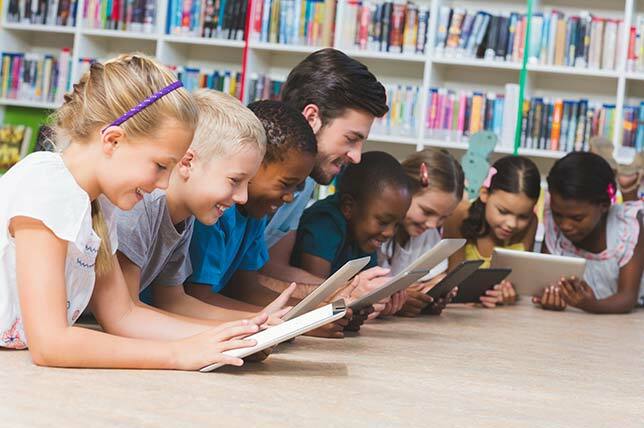 The latest report covered the reading patterns of 9.4 million students in grades K-12 from 30,062 schools across the United States. In total, students read 323 million books and non-fiction articles during the 2016-2017 school year, the year under study. The same research found that struggling readers who spent time reading every day could make up gaps in reading assessment. Students who read between 15 and 29 minutes every day gained 13 percentage points on assessments; those who read for at least 30 minutes gained 15 points. In spite of the plethora of different books available for children and young adults, year after year, they tend to read the same titles as those who came before them. Over the last decade, according to Renaissance's research, the typical student's reading journey most likely began with Dr. Seuss books in first grade (a favorite is Green Eggs and Ham), moved to Diary of a Wimpy Kid books by third grade (where it grabs 11 spots on the list of the top 25 books), added The Hunger Games by seventh grade (where it competes with Diary of a Wimpy Kid and Harry Potter), and ended with Shakespeare (specifically Romeo and Juliet, Julius Caesar, Macbeth and Hamlet) in high school. Classics — To Kill a Mockingbird, The Crucible, Of Mice and Men, Night, Animal Farm, Lord of the Flies — appear consistently on the lists as well. "Over the past decade, What Kids Are Reading has played a significant role in providing educators and parents with essential information about students' reading habits," said Eric Stickney, director of educational research at Renaissance, in a prepared statement. "For instance, we understand how the characteristics of reading practice differ for struggling readers who close achievement gaps vs. those who do not, and how reading practice impacts vocabulary exposure." The full report is available for registration on the Renaissance website.